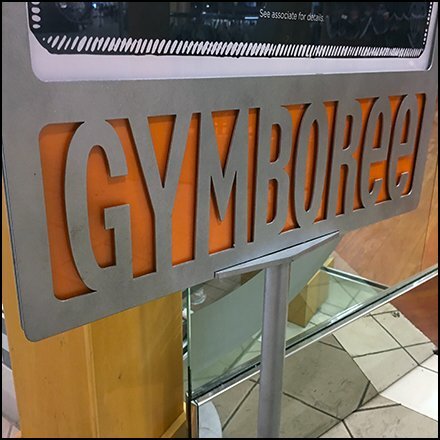 This Gymboree Branding In Silhouetted Stainless Steel is built right into the custom store entry sign holder. The approach is unique and designed to help Gymboree stand out in the marketplace, and brand consistently across all locations. I suggest the color background is swappable to allow change and a bit of freshening by season, but cannot certify that fact. This Gymboree Branding In Silhouetted Stainless Steel seen at the Wyoming Valley Mall, Wilkes-Barre PA.